Figure 1. 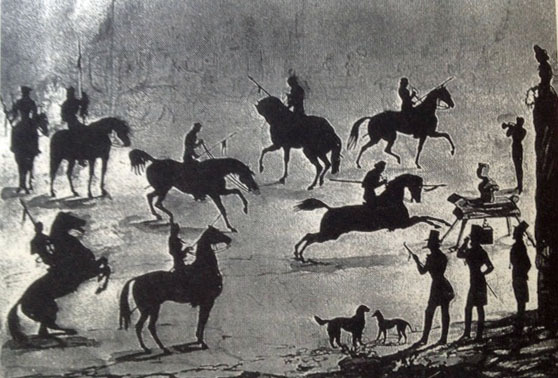 “A Maryland Tourney: Riding at the Quintain.” This silhouette shows the riders jousting at a mannequin knight, seen at the far right of the rendering (Private collection, copy at the Maryland Historical Society). After last week’s essay on Babe Ruth, a colleague informed me that all of my future blogs should be about sports. While I won’t always be able to oblige Ed, I was inspired to post another sports topic this week. After opening Calvert County’s tourism e-newsletter, I was astonished to learn that 2013 marks the 147th anniversary of the jousting tournament held each summer at Christ Church in Port Republic. The wooden bench from the Civil War Confederate submarine, the H.L. Hunley, completed its conservation treatment at the MAC Lab this spring. The first submarine in history to sink an enemy ship, the Hunley successfully used a torpedo against the USS Housatonic in 1864. The hand-cranked submarine rammed the explosive charge (which was projected from the Hunley by a pole) into the Housatonic’s starboard side and sank the massive warship. Shortly afterwards, the Hunley also sank with eight crew members on board. The submarine (a “secret weapon” of the Confederacy) was certainly ahead of its time: it would not be until the First World War that submarines were used commonly in warfare. Archaeologists and conservators from North Charleston, South Carolina, raised the Hunley in 2000 and conservation efforts have been ongoing. The MAC Lab’s conservation of the submarine’s benches marks the first time that any artifact from the Hunley has been conserved outside of South Carolina – and we are very proud to have been entrusted with the task! The submarine’s bench is currently packed for transport back to North Charleston. Eight men turned the propeller using a handcrank. Maximum speed was 4 knots. of ½ hour of air. Artist’s conception of the Hunley as it lay on the sea floor before recovery. A wallet recovered from the Hunley. Pocket watch belonging to the commanding officer of the Hunley, Lt. George Dixon. Our newest cannon is a 32 pounder from the C.S.S. Alabama, which comes to us from the Navy for some minor repair and conservation treatment. Built as a commerce raider, the Alabama inflicted extensive damage on United States merchant shipping before being sunk in 1864. Although the wreck of the Alabama was discovered in 200 feet of water off the coast of France (putting it within French territorial waters), the United States claimed ownership of the vessel as a spoil of war. In 1989, France and the United States established a joint French-American Scientific Committee to oversee archaeological investigation of the wreck, establishing a precedent for international cooperation regarding archaeology and the protection of historic shipwrecks. The Alabama cannon will remain at the MAC Lab on loan from the Navy as the replacement for another large cannon (an 18 pounder that goes on display in our new War of 1812 exhibit in April) so that visitors to the lab will continue to be able to view an example of a REALLY big gun.